I generally try to be optimistic about teams in my previews, but I also refuse to sacrifice realism in that pursuit. There’s no great way to sugarcoat the product that Kansas is going to put on the field this fall, it’s probably going to resemble Buzz’s girlfriend and garner similar responses from fans and other onlookers. A silver lining in all this is that new coach David Beaty, noted for his ability as a recruiter, might finally be the guy who can bring this program back to respectability. 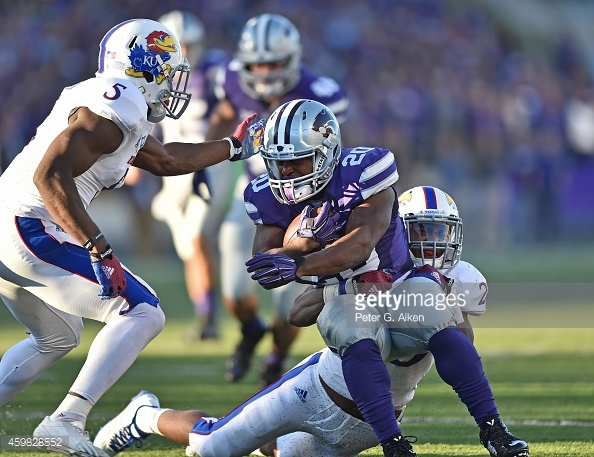 Athlon Sports considers the Jayhawks receiving corps as the only unit on the offense to not be the worst in the conference, and that group doesn’t return a single player who topped 100 yards receiving last season. Tight end Ben Johnson is the standout of this group, and with teams likely pressuring the quarterback early and often, added to the fact that Kansas will be playing from behind plenty, he could put up big numbers as a highly targeted safety valve. No offensive lineman on this roster has more than two career starts. The leaders in terms of experience are left tackle Larry Mazyck and center Joe Gibson. Gibson started seven games as a freshman, and Mazyck, a senior, has nine starts in his collegiate career. Leading returning rusher De’Andre Mann rushed for just under 400 yards on 86 carries last season and failed to score a touchdown, which could mean the door is open for a newcomer to steal the primary running back carries. Ke’aun Kinner is my money bet to be that guy. Kinner is a JUCO transfer who rushed for nearly 1,700 yards and 22 touchdowns in his last junior college year. He was offered by powerhouse programs like Texas and LSU coming out of high school, but failed to qualify academically. Montell Cozart figures to be the new guy at quarterback, and all I can say is that I hope starting suits him better than playing as a backup. Cozart’s numbers last season were not good, to say the least. He does flash some talent though, especially in the arm strength department. In terms of pure arm strength, he has one of the best arms in the conference. However, that only translated to 701 yards passing for five touchdowns and seven picks last season. It seems likely that the defense is slightly better than the numbers indicate, most likely due to the offense putting them in poor situations, but regardless they still aren’t stopping the Baylors and TCUs, and probably not even the Texas Techs and ISUs for that matter. 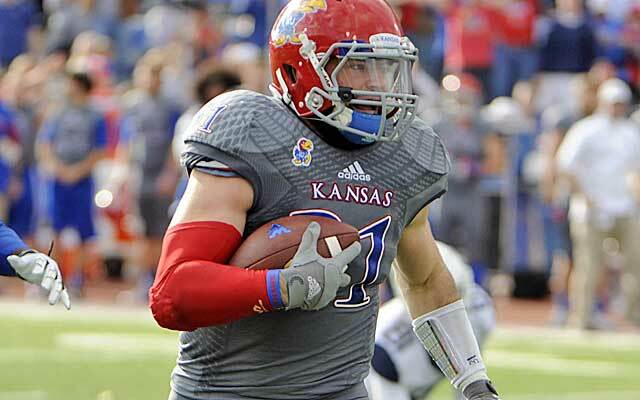 Kansas is moving a nickelback to linebacker to start and add depth in 2015. Safety-to-linebacker is a pretty common occurrence, but I don’t know if I’ve ever heard of a guy going from nickelback (essentially a cornerback) to linebacker. Of course, linebacker was the strength of this defense last season and if depth doesn’t matter probably will be again. Tevin Shaw is the aforementioned nickelback convert. He will be joined at linebacker by Courtney Arnick and hopefully Schyler Miles. I say hopefully about Miles, because his college career has been marred by injuries to date, but he is supposedly healthy now and ready to go. Arnick is the most accomplished returning linebacker after tallying 39.5 tackles, four for loss, and a sack in 2014. The defensive line is plenty deep, only losing two contributors, and has very little past production to speak of. True, there are five players up front who saw game action last season, and four of them saw it in more than ten games, but none of them topped twenty tackles or two sacks and only one topped two tackles for loss. Defensive tackle Andrew Bolton led the returners in the “tackles in the backfield” statistics with 3.5 tackles for loss and 1.5 sacks. The secondary also has that familiar combination of inexperience and lack of depth, especially with Shaw moving to linebacker. Fish Smithson (real name) is the leading returner at safety with 42.5 tackles. No other returning member of the secondary had more than 15. Also, no returning defensive back intercepted a pass, and no one had more than one pass broken up. Yeah, this defense is marginally better than the offense…probably. I feel bad being this harsh on a program that I have no issues with, but this roster is bare. Charlie Weis in a misguided attempt to save his own rotundus backside brought in a ton of transfers to try to bolster the record, and basically artificially show program improvement. It failed miserably. Now, Kansas is left with a bare cupboard and low morale. However, David Beaty is a good recruiter, as I mentioned earlier, and may have the tools to right this ship eventually. As for the schedule, I firmly believe if Kansas had to open the season with North Dakota State, rather than South Dakota State, then the 2015 would come and go without a Jayhawk victory.